HeartSine has taken an innovative approach to maintenance items by incorporating the AED batteries and electrodes into one single-use cartridge called the Pad-Pak™. The advantage to the Pad-Pak is that there is only one date to monitor and only one item to replace on expiration or after use. Each Pad-Pak has an industry-first four-year life, and provides 60 shocks or six hours of continuous monitoring. 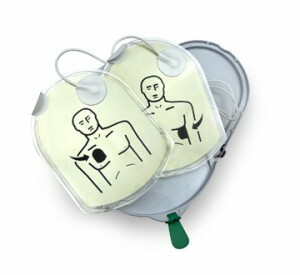 When battery power is down to 10 shocks or less, the HeartSine samaritan PAD emits an audible prompt. The HeartSine PAD’s built-in intelligence and unique Pediatric-Pak™ ensures the appropriate energy level is delivered for children. Adult Pad-Pak is gray in color and is for patients from 8 years old to adults and weighing >25 kg/55 lbs. Pediatric-Pak is pink in color and is for patients age 1-8 years old and weighing <25 kg/55 lbs. Saver EVO requires the HeartSine USB cable to interface with the HeartSine samaritan PAD. Saver EVO is free downloadable, available on the HeartSine website. The easy-to-use samaritan PAD Trainer with remote control guides users through simulated analysis, energy delivery and prompted Cardio Pulmonary Resuscitation (CPR) intervals with the look and feel of a live samaritan Public Access Defibrillator (PAD) with the actual charge and discharge of an electrical shock. A full range of AED accessories to complement your HeartSine samaritan PAD are available through your local Authorized Distributor. To purchase HeartSine products and accessories, please contact your local Authorized Distributor.